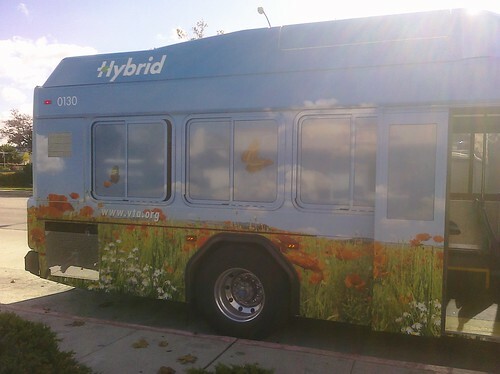 Early November I started noticing something new on my street: Santa Clara Valley Transportation Authority’s Route 66 is now being serviced by shiny new hybrid buses. 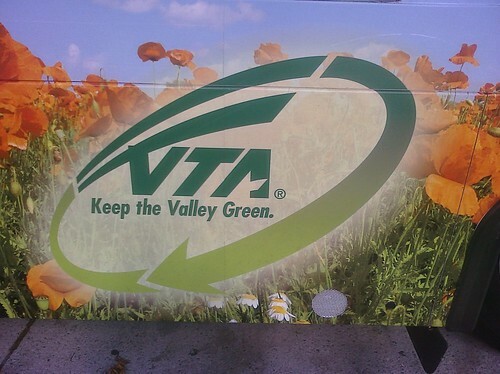 They’re hard to miss with eye-catching “Hybrid” labels on the sides, a reworked VTA logo with a new green swoosh around it, and a big boxy hump on the roof. 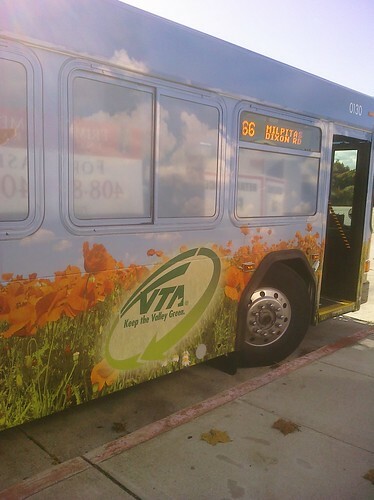 I went to VTA’s web site to check them out and learned that VTA is purchasing a “fleet of 90 American-made, low-emission diesel electric hybrid buses.” The cool thing is they used federal stimulus money as well as California Prop 1B funds to buy buses that are built by a company nearby in Hayward, creating and preserving green jobs here in the Bay Area: your tax dollars at work. The new buses are 90 percent cleaner and emit 15 percent less greenhouse gas than the nineties-era all-combustion coaches they replace. 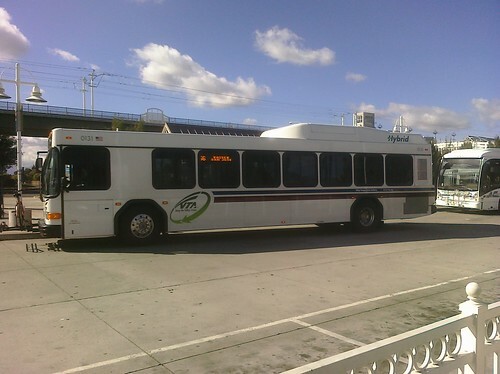 I love that Route 66 is the first to get these new buses. 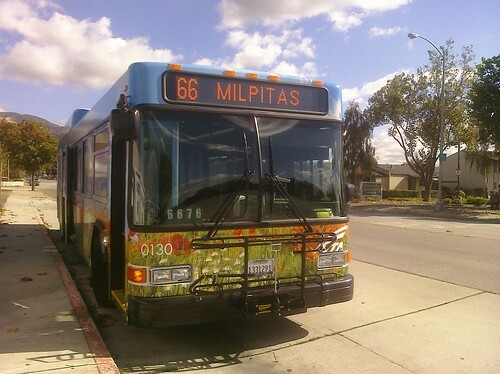 This route is the historic “El Camino de San Jose” bus line, coming up through San Jose on Monterey Road from the south, continuing onto First Street through downtown, then cutting over to Oakland Road and Main Street in Milpitas. After a few twists it terminates at Dixon Landing and North Milpitas Boulevard, at the county line. 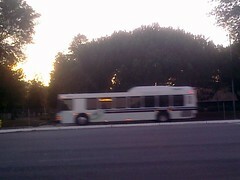 This bus was the first one I took on both my epic bus trips up and down El Camino Real. 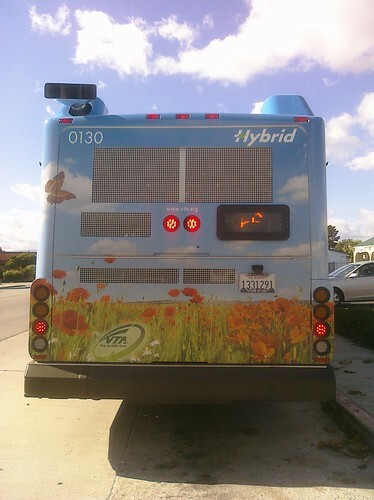 All the new hybrid buses I had seen were similar to the old diesel-only oneswhite paint jobs with blue and red stripes down the side. 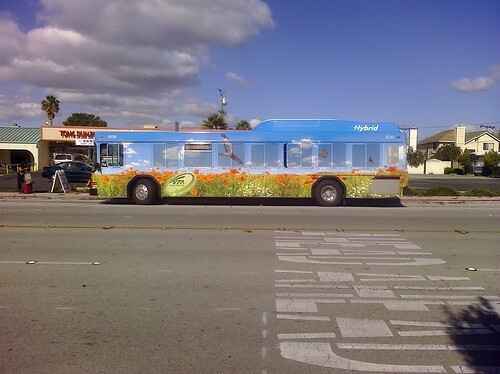 Earlier this week though I was driving on Oakland Road and I saw something completely different: a hybrid bus with a brand new colorful full-body wrap! It was gorgeous, depicting a blue sky, a field of golden poppies, and native California wildlife. 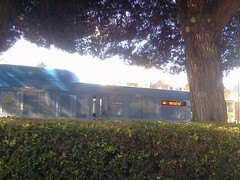 I desperately wanted to take a picture of it so I rashly made the decision to “follow that bus!” How hard could that be? It’s a bus that stops, right? It turns out I’m really bad at trying to front-tail a bus. I raced ahead of it (obeying all speed and traffic laws, of course) and pulled over to snap a shot of it, but I kept messing up the timing. 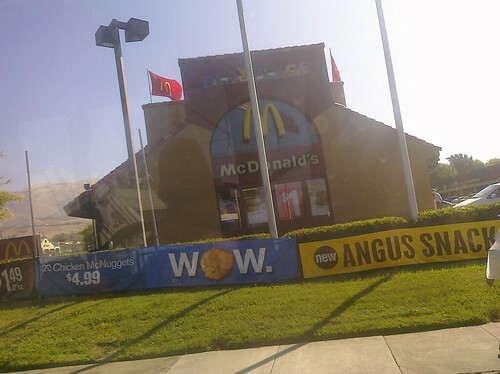 At one point I pulled way ahead of the bus into a parking lot and parked…behind a hedge. D’oh! After a couple more botched attempts I decided to go for the sure thing. I got behind it and followed it to the Great Mall where I know it waits for several minutes. Brilliant. Then I was separated from it by a red light. C’mon! C’mon! When I got to the mall it was still there. Awesome. Park, get out of the car, and bam, off it goes again. Augh!!! 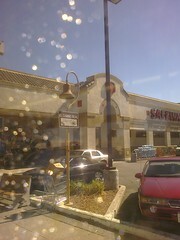 Back in the car, I tried to catch it at the Milpitas Library but failed to find a good ambush spot. Vroom, it’s gone. Sunnyvale biscuit! I’m no quitter. Undeterred I pulled ahead, determined to find a good spot, but I had a problem. I didn’t know the route past the library, and I didn’t have time to pull up the map on my smartphone. I literally had to sniff out the route, hopping from bus stop to bus stop. I felt like a caveman tracking a woolly mammoth (with fewer emissions). I lucked out and guessed correctly that it turns off Jacklin onto Escuela. I tried to trap it at the end of Escuela but again it eluded me because I couldn’t park close enough. By then I was literally shaking with frustration at the absurdity of it all so I just followed it until it finally came to rest at the end of the line. I parked in the Sunnyhills Apartment complex of all places. I had all the time in the world so I got my shots. Victory. I have no idea what the driver on break thought of the crazy guy stalking him from San Jose and taking tons of pictures of his bus, so I simply told him I was admiring the new paint job, and he understood that. I should mention that going southbound, Route 66 goes to South San Jose all the way to Santa Teresa and terminates at Kaiser Permanente San Jose Medical Center. The street it turns onto to get to the hospital is Camino Verde. “Green Road.” Kinda perfect. You are currently browsing the archives for the Oakland Road category.